Otherwise known as the “Ultra-Orthodox”, Haredim in Israel are getting a bad rap. They are being called “parasites” and “cowards”. They are being cursed by tens of thousands of people in Israel for refusing to “allow” their supposedly grown up sons (never mind daughters) to serve in the army, protecting that land and people of Israel. Their getting a bad rap – and the problem is that it is partially deserved. But in anger, many of us forget the shades of gray, the people who are…but are not. In an office in Tel Aviv, the air conditioning repairman sees that I am wearing a long skirt and a wig. In the secular world in which I sometimes travel for business, the wig is easier on their digestive systems than a scarf or a hat. Or at least it was. Years ago, when I made the switch, I had many people compliment my appearance. Anything from you look younger to you look like you lost weight, when all I did is surrender to the knowledge that many secular Jews make fast assumptions about religious women. Amazingly enough, the wig seems to set them at ease…some don’t even realize and compliment me on a new haircut if I wear the shorter wig. But more and more, the wig is being identified as being “Haredi” – which I am not. Though many, including within the Haredi world, would like you to believe that the difference between Haredi religious Jews and non-Haredi religious Jews is the level of observance, the “ultra” they seem to cherish, the fact is that the largest differences are political and not religious. I keep many of the same stringent “humras” (which at times I describe as excessive, voluntary and often torturous super-customs). But I am not Haredi, and I never will be. In fact, my skirt is longer – many of them view a skirt that goes to the floor as immodest (I have yet to understand that one). My sleeves are just as long as theirs; my neckline just as high. But I believe in our rights to this land not only as the promised land but for our indigenous rights, our well-documented historical claims, our political realities. In short, I love the State of Israel as well as the land of Israel. My sons proudly serve in the army; my daughters proudly do national service. My husband volunteers for the police; my sons (and daughter-in-law) volunteer for the emergency medical services and tonight, over the Sabbath, I will have an ambulance parked in front of my house. If there is a call, two of my sons will go running…in the middle of dinner, in the middle of the night. But my Haredim served the nation – both my son-in-law and my daughter. But my Haredim celebrate the land and the State of Israel and the flag of this nation touches their hearts. They mourn with the nation; they celebrate with the country. And my Haredim are dozens of relatives who speak Hebrew (and Yiddish) and call to bless my sons as they serve. No, their sons don’t serve and that bothers me, but they pray for my sons and for all our soldiers and they do not go into the streets to block traffic and attack people. The men among them speak to me, look me in the face, and ask and respond in a normal conversation between human beings. Respect. This is what they have always shown me – the men and the women. They come over at a wedding and ask me about my children. The men. The Haredim. My Haredim. Clarity often comes from our children. I told my son about how a man in my community, annoyed by having been delayed in traffic, attacked the Haredi community in Maale Adumim because of what Haredim in Jerusalem were doing. I defended my daughter, my son-in-law and their wonderful community of young parents who are raising their children, as they were raised themselves, in my beautiful city. Most of the fathers in that community served in the army; some grew up secular and later found that the Haredi world gave them more. In anger at the situation and at my countering his anti-Haredi attack on innocent people, many of whom were equally disturbed and disrupted by the Haredi protests and riots in Jerusalem, the man called me a “talking dog” and a “cow”. The school about which he complained has children saying psalms and praying for the soldiers during the moments of silence the nation observes and their parents will be seen standing as we all do. The man is ignorant (and rude) but he is also a perfect example of what is wrong with generalizing about “all” Haredim because of the actions of a fraction of the people who live and love their Haredi lifestyle. Obviously, the man’s insults still bother me – not so much his words because I dismiss those based on my knowledge of the man who said them – but the idea that you can bash innocent people simply because they loosely belong to a similar lifestyle as someone else. When I spoke to my oldest son, as is often the case, he “hit the nail” right away. Next time a secular person thinks you are Haredi,he told me, ask them why they hate the State of Israel – because, don’t all secular people hate Israel? Ask them if they are leftists? Aren’t all secular people left wing? Many of us do this – all Blondes are stupid; all women are bad drivers; all men are guilty of sexual harassment/assault. The answer, of course, is that this is not the case. Long ago, I was taught not to use words such as all, every, always, never. In most cases, with a single word, you prove yourself wrong. There are secular people who are anti-Israel and secular people who are among the staunchest supporters and lovers of this land. There are secular people who are left-wing, and others who are so right, even I would suggest that it’s scary. Blondes who are brilliant. There are fantastic women drivers and men who are kind and respectful to women. What is my purpose in writing this? Be angry at the protesters – for the illegal actions and for the conceit of thinking their time and lives are worth more than the tens of thousands of people they hurt callously. Curse them in anger. Scream at them in fury. Or better, ridicule them, as I choose to do here with these pictures. As far as I am concerned, when you go into the streets, desecrating not only the laws of the land, but of God, all bets are off. On the left and on the right, on the religiously secular and the religiously observant, as far as I am concerned, if you find so much wrong with this country that you need to take to the streets and disrupt the lives of tens of thousands of people who did nothing (and aren’t in a position to change whatever law you’re complaining about), you have no right to our respect, no right to all that this country already does for you. 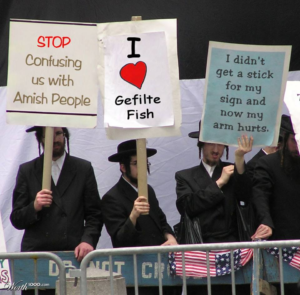 To the Haredim who have been protesting…stop using our streets, our buses, our electricity. Don’t call the ambulances or go to public hospitals when you need medical assistance. You don’t want to be part of this country; fine with us. But don’t be even more hypocritical than you already are. And to the Haredim (the 95% who are NOT protesting), I apologize for the insults you have received, for the assumptions made against you. The hatred of those Haredim protesting and rioting does not justify the hatred turned against you and I am embarrassed and hurt for the injustices that have been thrown against your community. And to my daughter and her husband and their wonderful community of young parents and beautiful children, I apologize for the words and actions of many who chose to attack you because you are an easy target. Daily, religious Jews say they are praying for the coming of the Messiah and then in words that divide Jews, attack innocent ones, they remind us why we still are waiting for the Geula, for the truest redemption. If you cursed the protesters this week, you were right; if you cursed Haredim, including MY Haredim, you are part of the problem. Paula, wonderful blog. Look at all the fabulous work haredim do for the general public. Ezer Mizon, Zaka, all the gemachim, Chai Line, Zichron Menachem and the list goes on. Well written, but I do not understand their lifestyle. I do not understand the need to impose things on people because THEY think it is correct. In a democratic lifestyle, there must be room for dissent, but going against your own “People” seems like it divides a nation as well as a family. I was on a bus that was stoned leaving Jerusalem before the end of Shabbat. I could not guess the mindset that it was okay to break the Sabbath by physically throwing rocks at a moving vehicle. I haven’t got a clue how throwing stones at a bus is allowed…just no clue. I’m sorry you were assaulted this way and I wish the police would have arrested those who threw the rocks and charged them with attempted murder. I don’t support this at all and honestly, just as those who are protesting the draft are not “my” Haredim, these violent law breakers aren’t “mine” either. There are certain things that you have not mentioned. My grandfather used to say that anybody can do what they like as long as it does not affect them. 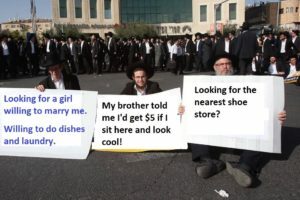 Unfortunately these haredim as you have mentioned block traffic. Secondly they have many children who will act like they do and will effect the Israeli state and our security. Thirdly we the tax payers help support the yeshivas they study at or supposed to study at. Fourthly some municipalities put non Haredi citizens at a disadvantage by charging lower Annona rates that non Haredi citizens pay. “studying” there and, in fact, where a yeshiva IS taking government funds, authorities should make regular checks and anyone who is not learning when there’s a check, should have their draft exemptions canceled.